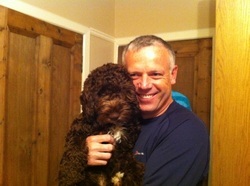 My name is Andy Taylor and I live in Barrhead on the outskirts of Glasgow with my wife Anna and our lively cockapoo, Angus. In 2011 I retired from the Army, having served 24 years with the Royal Engineers. My plan, as the end of my service approached, was to step and straight into a Health and Safety role, either in the UK or Abroad...but what they say of the best laid plans is certainly true, and following a back injury whilst still serving I spent most of my early retirement in agony on my living-room floor - unable to walk properly, never mind able to take on any sort of employment. Anna was working full time and as time went on the long hours alone became harder to cope with. In her infinite wisdom Anna decided that I needed a companion, and in March 2012 our gorgeous chocolate cockapoo boy, Angus, entered our life... A true tonic indeed. Barrhead, Neilston and surrounding areas. It was during my walks with Angus that the idea of dog walking began to grow on me. On my walks I often spoke to other dog walkers, who like myself share a love of dogs and the outdoors, and I soon realised that Dog Walking was the perfect career choice for me - with a move to a large detached house only 6 1/2 miles from Glasgow Airport - with enclosed gardens and plenty of additional living space - came the addition of Home Boarding*, Dog Day Care and Pet Home Visits all under the umbrella name Taylor Made Activities. That was all in 2012. Since that time Taylor Made Activities has become Taylor Made Activities Ltd and expanded to include two full time employees. Taylor Made Activities Ltd is fully licensed and insured - details of which can be found under Licence and Insurance. I am trained in Canine First Aid. In am disclosure checked through Disclosure Scotland.